A gastronomical route through Guia de Isora. 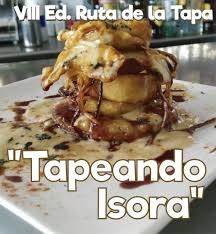 Tapeando Isora is a popular yearly gatronomical route which takes place throughout restaurants and bars in Guia de Isora, who offer tasty tapas and drinks for just €2.50 from Thursday to Sunday. Those following the route can get a card from the participating establishments,who will stamp them along their tapa crawl and can use it to enter the prize draw.